daily dose of spazz: I'm outta here! 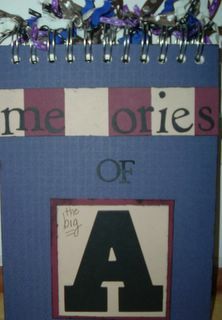 My Big A Memory Book... So me that the M fell off, I'm leaving it like that! Well, the tour is officially over... Phew! This was the final performance as a member of the Archiver's staff. The final tour was very sentimental to me. So many kind words were thrown my way this weekend, I am walking on cloud nine. You ladies have no idea how much it means to me when you tell me "You are so good at this." I loved teaching people to do what I love doing. I loved giving people the Simone Secrets and thrifty tips. And I loved being surrounded by all that paper!! As, I was getting ready to leave today (running around to buy something, but didn't know what I would "need"), I didn't feel even an ounce as sentimental as I did yesterday. But then, this little darling, Kamryn looked at me and waved. I remembered this girl and her mom, so well. Over a year ago, when we were still doing demos at the front counter, they came in. I remember telling this little girl that she was beautiful and making a little bookmark with her name on it. She was ecstatic, her face lit up. When they came in today and I was working a Make and Take project with them, I had told someone else that today was my last day and the mom (Claire) instantly said, "Oh no!" I was touched. So, when the little girl waved I thought... There is probably one of the youngest little girls I have ever turned on to Scrapbooking and I wouldn't get to teach her any more. There was so much more I was going to show her when she turned 6!! So, that is what I will miss!! I will miss great people... Great people that I worked with and great customers that I would have never met had I not taken this evil retail job. So was it worth it? YES! I would do it all over again, just for the chance to meet such incredible people and make such great friends! I am more fired up than ever about starting things for myself. I have taught under the corporate thumb for long enough... Now, I will do things my way!! The Spazz Way!! The only way I know how, cracking up and using Simone lingo all the way! You have no idea how many times I got in "trouble" for all that at the store! But no more! It is my way or no way and it will be better. I will be better for it! I am fueled by you ladies to Make it Happen!!! So, keep in touch, drop me a line and I will fill everyone in on the Spazz possibilities very soon. I have some awesome things brewing in my brain.....gotta go scrap them!! So, I can tell you sooner. **Patricia was kind enough to take a picture of me saying "I'm outta here" and when she sends it to me I'll update with the photo. Thanks Patricia, you are the best!! !